Orofacial trauma resulting in tooth avulsion creates special problems for the child and dentist. Avulsion accounts for 0.5-16% of traumatic injuries in the permanent dentition. , Avulsion of permanent teeth can occur at any age, but is most common in the young permanent dentition. Management of avulsed teeth is done by immediate replantation of the avulsed tooth into its own socket. The replantation of an avulsed tooth depends on the specific clinical conditions associated with that particular avulsed tooth. These clinical factors include the physiologic status of the periodontal ligament, the stage of root development and the length of extraoral time. Longer the time elapsed for an avulsed tooth, worse the prognosis for survival. Nevertheless, replantation of an avulsed tooth for a child is advised even if the prognosis is not good. , Post-traumatic root resorption eventually follows resulting in loss of the traumatized tooth. The present case report utilizes the natural crown of one of the two replanted teeth that showed failure, as a pontic in a fixed semipermanent bridge. A South Indian girl aged 14 years reported with her mother to the Department of Pedodontics and Preventive Dentistry with the chief complaint of loss of upper-left front teeth two days back due to a fall from the staircase and the girl was taken to a private hospital where she had been given medication for pain relief. The teeth were collected from the incident site and were stored in a plastic box and kept in the freezer by the parents. Health and family history were not significant. On examination, the face was bilaterally symmetrical with competent lips and no other injuries. Intraoral examination revealed permanent dentition except for missing left maxillary central and lateral incisors, unerupted permanent second and third molars and bilateral Class I molar relation and fair oral hygiene status. Examination of avulsed teeth showed intact crowns with closed apex. Intraoral periapical radiovisiograph was advised to check the integrity of alveolar socket [Figure 1]a- c, and the diagnosis of avulsion was confirmed. The treatment planned was to replant the avulsed teeth after extraoral endodontic treatment followed by stabilization. As this was a case of delayed replantation, endodontic treatment was initiated before replantation. Debridement and sterilization of root canals with 2.5% sodium hypochlorite and the canals were filled with calcium hydroxide. A 2.4% acidulated sodium fluoride solution (pH 5.5) was applied to the roots of avulsed teeth for 20 min and both the teeth were replanted into their respective sockets with gentle digital pressure. Once the teeth were properly seated, they were checked for alignment in occlusion and were splinted to the adjacent teeth with a 0.5 mm rectangular stainless steel wire and acid-etch composite. Periapical radiograph was obtained to confirm proper positioning of the replanted teeth. Systemic antibiotics were prescribed for 7 days, dietary and oral hygiene instructions were given. The replanted teeth were obturated with gutta-percha after 1 week. When the splint was removed after 2 weeks, the maxillary left central was slightly extruded compared to the contra-lateral tooth. Regular follow-up visits were scheduled. At 4 months recall, a periapical radiovisiograph revealed interdental bone loss with clinical mobility of implanted central incisor [Figure 2]a. It was decided to extract the mobile tooth to prevent the residual alveolar defect in consultation with periodontist. After extraction, the site was sutured to enhance the healing process. The extracted tooth was rinsed with normal saline and sectioning of the tooth was done in a horizontal plane at the level of the cementoenamel junction with a diamond abrasive disc. Remnants of gutta-percha points were removed and contouring of the crown was done with a flame-shaped bur. Etching of the pulp chamber was done using 37% phosphoric acid, followed by washing and drying for 15 s. Bonding agent was applied to the etched surface, and finally the access opening was sealed with light cure resin composite material. After suture removal and inspection of the site, a fast setting alginate (Tropicalgin® , Zhermack) upper impression was registered with segment trays and cast was made using dental stone to check for proper fit of the crown. A 0.010 in orthodontic ligature wire was taken and folded in the middle to form two strands, which were then twisted together. The required length of wire was cut checking on the cast so that it covers the right central incisor, left lateral incisor, and left canine. Extension of the wire on the left side was up to canine to prevent excess load of forces on the replanted left lateral incisor. A groove was made on the palatal surface of the prepared crown at the middle third with a straight fissure bur, ensuring that it would not interfere with occlusion. Then the ligature wire was fixed into the groove with the light curing flowable composite (Z350; 3M ESPE® ). Trial of the crown was done in the desired anatomic position and the wire to be fixed onto the adjacent teeth was adapted passively to their lingual surface with the help of an orthodontic plier, occlusion was checked and then fixed with light curing composite resin [Figure 2]b and c. Postoperative occlusion and aesthetics was checked and oral hygiene instructions were reinforced and she was advised soft diet for 1 week. Strict instructions to avoid biting with front teeth were given. The patient is still under review and regular follow up is required to monitor the status of the replanted left lateral incisor. First recall appointment was made 2 weeks later and a periapical radiovisiograph was taken [Figure 2]d.
The prognosis for avulsion improves if the periodontal ligament cells are preserved. Vital periodontal ligament cells can reattach when replanted and viability is best maintained if the tooth is replanted within the first 15-20 min after avulsion. Degeneration of the periodontal ligament depends on several factors, such as trauma, management of the root, extra-alveolar period and storage medium. Survival rates can be increased if a suitable storage medium was available. Various media are available: Viaspan™ , Hank's balanced salt solution (HBSS), cold milk, contact lens fluid, tender coconut water, physiologic saline, saliva (buccal vestibule), and water. Recently, casein phosphopeptide-amorphous calcium phosphate (CPP-ACP) has also been proved in vitro as a transport medium. Though the risk of progressive replacement resorption and subsequent tooth loss is high after a long dry storage, reimplantation makes a provision for aesthetically acceptable permanent prosthesis at a later age. In the case presented here, though the avulsed teeth had been kept in the freezer for 2 days and was anticipated that there were no chances of healing, the teeth were replanted. Ebeleseder et al. suggested that replantation should be considered a temporary solution in children and adolescents and the benefit is mainly the time gained to establish an optimal treatment plan. Replacement resorption of replanted mature teeth was more extensive and the overall prognosis was not good for children and adolescents when compared with adults. The resorption that so frequently follows the procedure takes some time to initiate tooth mobility resulting in eventual loss of the traumatized tooth. Various treatment options available include: placement of natural crown or acrylic tooth in fixed prosthesis , or removable prosthesis, , bridges,  fiber-reinforced composite, ,, autotransplantation,  implants,  and substitution of laterals and canines. All the possible treatments were explained to the parents and consent for use of the natural crown was obtained. Removable partial dentures commonly used for tooth replacement have the disadvantages of need for patient compliance, bulk, predisposition to fracture, problems in maintenance of hygiene, tissue inflammation, and papillary hyperplasia. Also problems related to lack of stability, unfavorable distribution of stress and the need to change the prosthesis frequently to accommodate the healing phase of the edentulous region. The crown of natural tooth can be used as a part of a space maintainer, , but these require banding of first permanent molars and there is chance of decalcification under the bands. A conventional bridge requires preparation of healthy abutment teeth for crowns and in a growing child, the anatomic considerations of size of the pulp, continuing soft tissue changes should also be considered. Maryland bridges used for restoring a missing tooth require slot preparation in the abutment teeth to receive the retentive extensions of the wings of the pontic  and problems of debonding the cast metal framework from the luting cement or debonding of the luting cement from the enamel surface. Fiber-reinforced composite (FRC) bridges are advantageous over the Maryland bridges in that very little or no tooth reduction is required. FRC bridges help in providing enhanced esthetic concept,  eliminates the need of performing complicated laboratory procedures and can be done as a chair side replacement. These bridges do not restrict intercanine arch dimensions in a growing child and the need for renewing the appliance can be avoided. However, the disadvantages include difficulty to clean. Autotransplantation of teeth to replace missing incisors can be considered during the mixed dentition if suitable donor teeth are available in the mouth. It allows for normal development of alveolar bone until growth has ceased and also prevents future placement of bridges or implants. Andreason et al. reported survival rates of 95% and 98% for teeth transplanted with incomplete and complete roots respectively. However, inflammatory or replacement resorption can occur and this requires expertise. Implants are definitive treatment for single tooth replacement. But these must not be considered too early because it will appear submerged if the adjacent teeth erupt resulting in an unesthetic appearance. So, placement of an implant is delayed until growth has ceased, which occurs by 18 years of age. If the child is in a mixed dentition period, substitution of laterals and canines can be effective for treating missing maxillary central incisor. The laterals were allowed to drift bodily toward the midline followed by orthodontic closure of space. The laterals were provisioned as central incisors, and the canines were provisioned as laterals followed by leveling the gingival margins finally. Space closure without prosthetic replacement can be possible, thereby preserving the thickness of the alveolar bone. , Once full complement of teeth had erupted, the space for the missing tooth was opened with orthodontic treatment and a provision can be made for either a bridge or implant because the alveolar ridge was preserved. The disadvantages are the length of the treatment period and technique sensitivity. The technique described here offers a simple and effective treatment option for the management of failures in replanted teeth using the extracted crown portion of the natural tooth as a pontic in a semipermanent bridge. This fixed-interim prosthesis can be considered as a noninvasive and long-term provisional treatment, while providing superior aesthetics and function, the cost effectiveness of this technique made it superior to all other options. This is of great psychological benefit to the child and adds to her self-esteem. 1. Andreasen JO, Andreasen FM. Avulsions. In: Andreasen JO, Andreasen FM, editors. Textbook and colour atlas of traumatic injuries to the teeth. Copenhagen: Munksgaard; 1994. 2. Ram D, Cohenca N. Therapeutic Protocols for Avulsed Permanent Teeth: Review and Clinical Update. Pediatr Dent 2004;26:251-5. 3. Cobankara FK, Ungor M. Replantation after extended dry storage of avulsed permanent incisors: Report of a case. Dent Traumatol 2007;23:251-6. 4. Khalilak Z, Shikholislami M, Mohajeri L. Delayed tooth replantation after traumatic avulsion: A case report. Int Endod J 2008;3:86-9. 5. Adil NF, Ahmed SS, Jindal MK, Arshad SH. Delayed replantation of avulsed teeth. J Indian Soc Pedo Prev Dent 2007;25 Suppl:S17-9. 6. Ebeleseder KA, Friehs S, Ruda C, Pertl C, Glockner K, Hulla H. A study of replanted permanent teeth in different age groups. Endod Dent Traumatol 1998;14:274-8. 7. Ulusoy AT, Cehreli ZC. 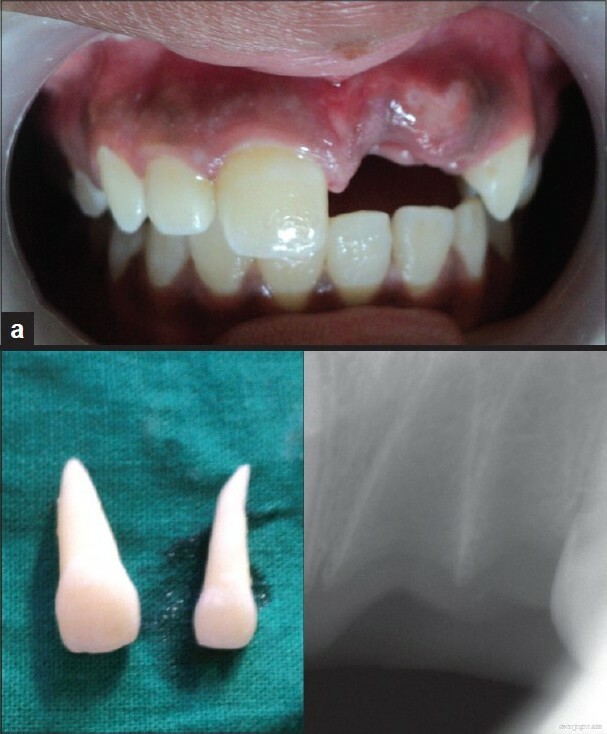 Provisional use of a natural tooth crown following failure of replantation: A case report. Dent Traumatol 2008;24:96-9. 8. Kitasako Y, Ikeda M, Burrow MF, Tagami J. A technique using resin composite with orthodontic wire to replace a missing tooth rapidly. Dent Traumatol 2008;24:127-30. 9. Tuzuner T, Kusgoz A, Nur BG. 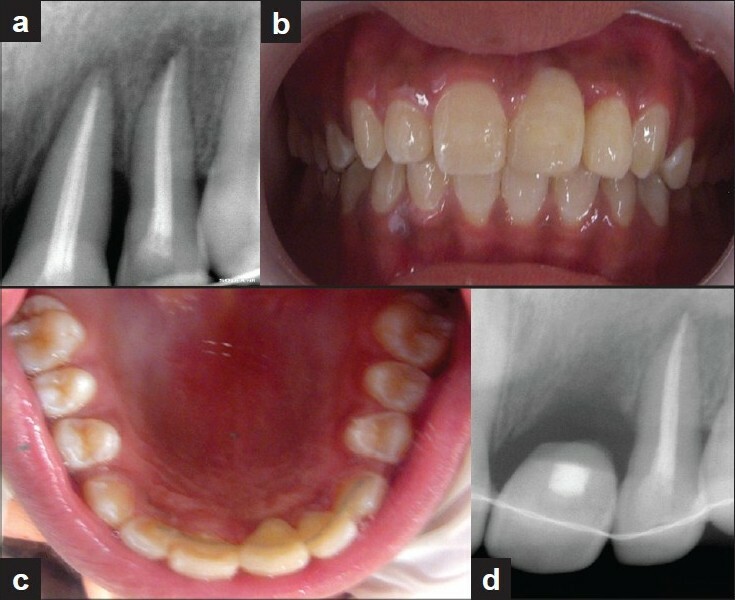 Temporary management of permanent central incisors loss caused by trauma in primary dentition with natural crowns: A case report. Dent Traumatol 2009;25:522-6. 10. Oliveira LB, Tamay TK, Oliveira MD, Rodrigues CR, Wanderley MT. Human enamel veneer restoration: An alternative technique to restore anterior primary teeth. J Clin Pediatr Dent 2006;30:277-9. 11. Parker RM. An ultraconservative technique for restoring a missing central incisor. Contemp Esthetics 2007;7:30-4. 12. Aydin Y, Kargul B. Glass-Fiber Reinforced Composite in Management of Avulsed Central Incisor: A Case Report. J Dent Child 2004;71:66-8. 13. Chafaie A, Portier R. Anterior Fiber- reinforced Composite Resin Bridge: A casse report. Pediatr Dent 2004;26:530-4. 14. Chauhan M. Natural tooth pontic fixed partial denture using resin composite-reinforced glass fibers. Quintessence Int 2004;35:549-53. 15. Rao J, Fields HW, Chacon. GE Case report: Autotransplantation for a missing permanent maxillary incisor. Pediatr Dent 2008;30:160-6. 16. Ticheler HM, Abraham JE. Management of a congenitally missing maxillary cantral incisor. A case study. N Y State Dent J 2007;73:20-2. 17. Kokich VG, Crabill KE. Managing the patient with missing or malformed maxillary central incisors. Am J Orthod Dentofacial Orthop 2006;129:S55- 63.